@JackSparrowGifGrader, your father left you in this world without him to guide you through it, he must’ve thought that you were ready. And with a role model as brave as your father having raised you, I’m certain that you too will one day become as great a person as your father was. Remember what he taught you. Remember that he died to save the lives of others. Remember that he will always be with you, as long as you don’t forget the sacrifice he made, and always try to treat people with as great respect and kindness as he did. Try to be the person that your father would want you to be. Try to act in a way that would make him proud. And honour him by learning from the lessons he taught you while he could. And most importantly, stay strong. He will always be with you, in your heart. He will live on through you, and as long as he is never forgotten, he will never truly be gone. @another Aussie, He died a Hero he could of could of taken the easy option but he put others before himself, a true hero in every sense of the word,take solace in that’s the kind of man he lived as. I am standing upon the seashore. A ship, at my side, spreads her white sails to the moving breeze and starts for the blue ocean. She is an object of beauty and strength. I stand and watch her until, at length, she hangs like a speck of white cloud just where the sea and sky come to mingle with each other. Then, someone at my side says, "There, she is gone." Gone where? Gone from my sight. That is all. She is just as large in mast, hull and spar as she was when she left my side. And, she is just as able to bear her load of living freight to her destined port. Her diminished size is in me -- not in her. And, just at the moment when someone says, "There, she is gone," there are other eyes watching her coming, and other voices ready to take up the glad shout, "Here she comes!" @another Aussie, eat some Nutella. That usually helps. If all else fails, have a good cry. I'm a simple man. I can only offer simple answers here. @another Aussie, stay strong. And if you ever need some people to talk to.. this community is like a second family. Know that unlike some other online communities, we truly care. And we will help as much as we can when our family needs us. @another Aussie, It’ll take a long time to process. Just remember that it’s ok to grieve and don’t let people pressure you into moving faster through this process than you’re ready to. You deserve to take whatever time you need to heal and try to get used to your new normal. We’re all here for you, in the limited capacity that we can be, and once again, I’m giving you an internet hug. Also, don’t forget to eat and take care of yourself. Mostly don’t forget to eat. @another Aussie, sorry for your loss, you ever need to talk theres always more than a few of us on here wanting to help you through anything. Stay strong my friend. @another Aussie, Sorry for your loss. It sounds like your father was an amazing man and I’m sure he will be missed greatly. I haven’t lost my father yet so there’s no way I can relate equally but I’ve found that in times of loss or strife, keeping yourself busy helps. Whether it’s a part-time job, more time at the gym, or even picking up a past-time like painting or poetry. It all helps. The trick is to not to shut down and to keep moving forward. @Danjermouse, yeah I know that distractions help and I am trying but I fear it's a bit much at the moment... time and wounds. @another Aussie, my deepest condolences. The passing of a loved one is always hard. I'm so sorry that your father was taken from you so suddenly. It sounds like your father had an honorable death. I lost someone last year in a sudden event, and it's still hard for me to believe that they are gone. There are many steps in the process of grieving. It's not a linear process, and we all grieve differently. Please make sure to take care of yourself at this time. And please seek help from family/friends/us/counselors/etc. @another Aussie, your dad is a hero and now you have someone looking out for you from above. Keep your head up! I'm sorry for your loss and i want to help you, if there is something just let us/me know. @another Aussie, our hearts are with you man. @another Aussie, spend time with any family or close friends you can. Hug, cry, and love each other but know you will get through this devastating time. You’re not alone and you are loved. @another Aussie, I share in your sorrow for the world has lost a truly heroic man and most people won't even be aware of that sad fact. But I am, and this community is, and I want you, personally, to know you are never truly alone as long as you have funny pics, and the memory of your dad. I'm sorry for your loss, R.I.P. one truly inspiring man. @another Aussie, Don't cry because he is gone, smile because he was here. Remember your dad as he lived, a good man. @another Aussie, my deepest condolences. What a brave man your father is. You should be proud. I want to give you some advice, as I lost my mother 7 years ago... It never stops hurting. It just doesn’t, and one day you’ll realize that and it’ll be slightly easier, but none the less painful. And don’t forget the not so great memories either, since they helped shape the person your father is and who you are. This is your personal pain and no one will ever be able to understand it. I’m deeply sorry for your loss, but I hope you celebrate the life that lived. @another Aussie, Sending my love and thinking of you and your family today. 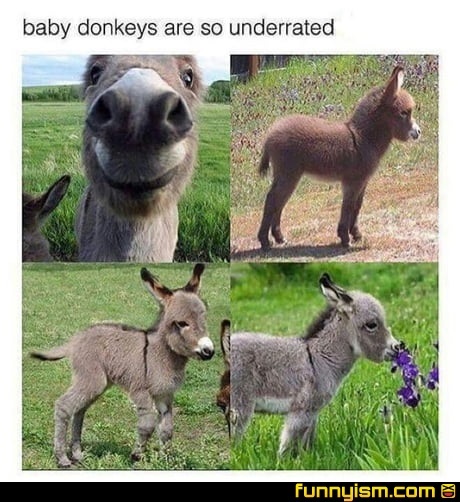 Yes, but that same logic, baby HUMANS are underrated. And no, they're not; if anything, baby humans are severely overrated.